HYGIENE SERVICE wish to expand her network of REPRESENTATIVES - FRANCHISEE all around Europe. Hygiene Service, the largest company in the field of Hygiene Services, has been the market leader for 15 years! 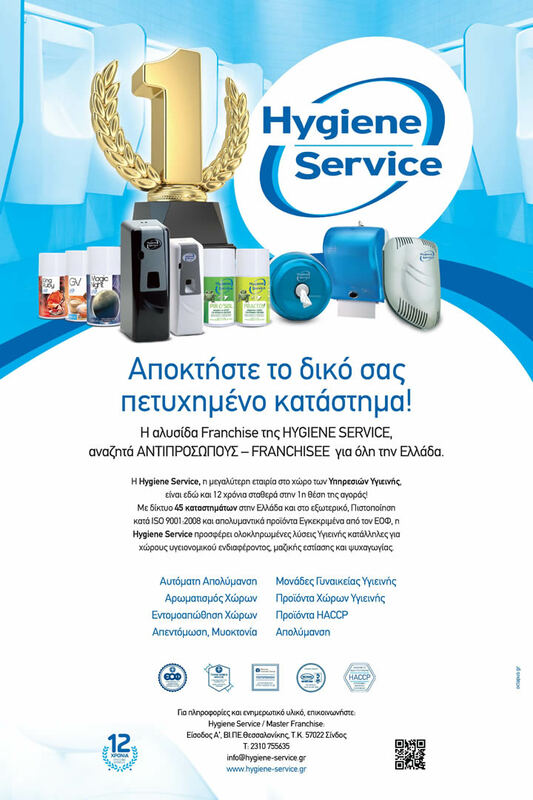 With a network of 45 branches in Greece and abroad, ISO 9001: 2008 Certification and Disinfectant Products Approved by National Organization of Medicines, Hygiene Service offers complete hygiene solutions suitable for areas of sanitary interest, mass catering and entertainment. For more than 15 years, Hygiene Service has been serving with professionalism catering, entertainment and commercial operations throughout Greece and abroad. The great advantage of Hygiene Service is the wide range of innovative and full range of products and services, and Pest Controls applies for Washroom area, WC, Kitchen and Service area. We offer Services, that upgraded business premises and appeal to professionals who respect their customers and employees, wanting to always offer the best. The email has been successfully sent. We will contact you as soon as possible.